Sherpa is the X-ray satellite Chandra modeling and fitting application. It enables the user to construct complex models from simple definitions and fit those models to data, using a variety of statistics and optimization methods. 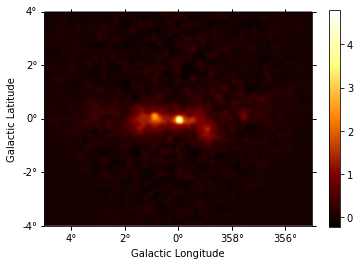 The issues of constraining the source position and morphology are common in X- and Gamma-ray astronomy. This notebook will show you how to apply Sherpa to CTA data. Here we will set up Sherpa to fit the counts map and loading the ancillary images for subsequent use. A relevant test statistic for data with Poisson fluctuations is the one proposed by Cash (1979). The simplex (or Nelder-Mead) fitting algorithm is a good compromise between efficiency and robustness. The source fit is best performed in pixel coordinates. This tutorial has 2 important parts 1. Generating the Maps 2. The actual fitting with sherpa. Since sherpa deals only with 2-dim images, the first part of this tutorial shows how to prepare gammapy maps to make classical images. 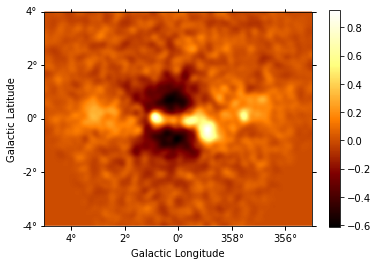 We first generate the required maps using 3 simulated runs on the Galactic center, exactly as in the analysis_3d tutorial. It is always advisable to make the maps on fine energy bins, and then sum them over to get an image. np.logspace(-1, 1.0, 10), unit="TeV", name="energy", interp="log"
Since sherpa image fitting works only with 2-dim images, we convert the generated maps to 2D images using make_images() and save them as fits files. The exposure is weighed with the spectrum before averaging (assumed to be a power law by default). In principle one might first want to fit the background amplitude. However the background estimation method already yields the correct normalization, so we freeze the background amplitude to unity instead of adjusting it. 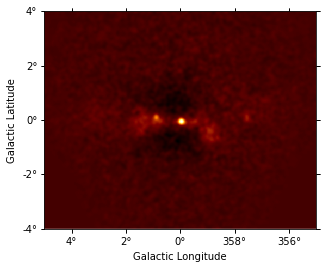 The (smoothed) residuals from this background model are then computed and shown. /Users/jer/anaconda/envs/gammapy-dev/lib/python3.7/site-packages/sherpa/instrument.py:723: UserWarning: No PSF pixel size info available. Skipping check against data pixel size. Fit all parameters of this Gaussian component, fix them and re-compute the residuals map. When adding a new source, one needs to check the significance of this new source. A frequently used method is the Test Statistics (TS). This is done by comparing the change of statistics when the source is included compared to the null hypothesis (no source ; in practice here we fix the amplitude to zero). The criterion for a significant source detection is typically that it should improve the test statistic by at least 25 or 30. We have added only 3 sources to save time, but you should keep doing this till del(stat) is less than the required number. Keep adding sources till there are no more significat ones in the field. How many Gaussians do you need? Use other morphologies for the sources (eg: disk, shell) rather than only Gaussian. You could read over the examples there, and try to apply a similar analysis to this dataset here to practice.